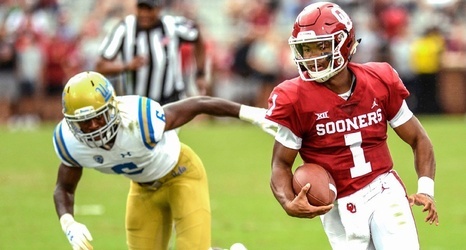 Oklahoma quarterback Kyler Murray is committing to playing in the NFL. The Heisman Trophy winner, who was picked in the top 10 of the 2018 MLB draft by the Oakland Athletics, announced Monday that he is "fully committing my life and time to becoming an NFL quarterback." He'll be at the combine later this month as he prepares for the 2019 NFL draft. Murray, who had 54 total touchdowns and just seven interceptions for the Sooners last season, is ranked as the No. 2 quarterback in this class by ESPN draft experts Mel Kiper Jr.